These are some of the most frequently asked questions related to custom car fresheners. If you don't find what you’re looking for, please email us. How is my custom car freshener price determined? What fragrances do you offer? What happens after I place my custom car air freshener order? Can I pay with check or purchase order? Do you use recycled paperboard for your fresheners? Are the personalized air fresheners individually wrapped? How thick is the car air freshener paperboard? Can I do a custom fragrance? How long will it take to make and receive my order? How much for 2-sided printing? Quantity, Shape, and String Color. The more you purchase, the lower the per-piece price goes. Not all shapes are created equal. Some are easier for us to make, and are therefore less expensive. 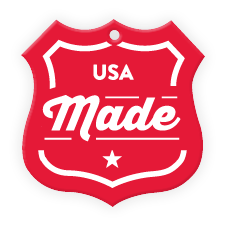 Our custom air freshener shapes are separated into tiers, with “Tier 1” being the lowest cost. White string is included free of charge. All other string colors carry a small additional charge. Please refer to our pricing page for more information. Our minimum order is as low as 8 for some shapes. For most custom air freshener shapes our minimum order is fifty pieces, but check the shapes page to be sure! Most certainly! A custom air freshener sample pack will contain one sample of each of our 19 fragrances, just for the price of shipping. You'll receive an order confirmation email outlining the rest of the process. If you've chosen to receive order status updates, then we’ll send you an email every time your order moves to the next process in our factory. At this time, we only accept credit cards. Yes, our custom air freshener board is 25% pre-consumer waste. Believe it or not, the recycled portion is from disposable diapers. Remember….. I said PRE-consumer waste. Shelf life is two years, if stored in a cool dry place. We use 85pt paperboard (about the same thickness as a nickel). Once taken completely out of the wrapper, the personalized air freshener should provide a pleasant aroma for at least 10-15 days in mild climates. Expect aroma longevity to decrease in hot climates. If only a portion of the wrapper is taken off the freshener, aroma longevity will be greatly increased. We are unfortunately not offering custom shapes at this time. If a custom shape is required, and you're prepared to order at least 5,000 pieces, we recommend CustomFresheners.com. We are unfortunately not taking orders with custom fragrance at this time. If a custom fragrance is required, and you're prepared to order at least 5,000 pieces, we recommend CustomFresheners.com. Our normal production time is three weeks, however, we offer several rush options down to 24 hours. We also offer several shipping options down to 24 hours. Our standard pricing includes printing on both sides of the Freshener: It's our "Buy 1 side, get the 2nd side free" guarantee!